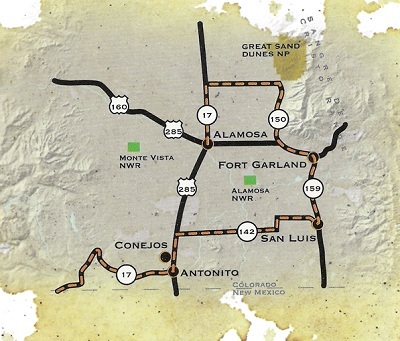 The Los Caminos Antiguos Scenic Byway covers 129 miles and takes about 3 hours to drive, longer if you plan to stop at the different destinations. It passes by beautiful areas such as the Great Sand Dunes, Zapata Falls, and Colorado’s oldest town. Los Caminos Antiguos Scenic Byway can be driven in either direction. You can start in Alamosa, Colorado and end in Chama, New Mexico or start in Chama and end in Alamosa. Since this site is mainly about the San Luis Valley I (Kaylie) have chosen to take you through the journey as you leave Alamosa. If you are driving the tour starting from Chama, just reverse my suggestions! The choice is entirely up to you!! Have you driven Los Camino Antiguos? Click here to share your road trip. Great Sand Dunes National Park: Plan to spend a half or full day here to play in the sand! Zapata Falls: Beautiful picnic area and easy half mile hike to the waterfall. Fort Garland: The Fort Garland Museum has lots of historical information about the area. 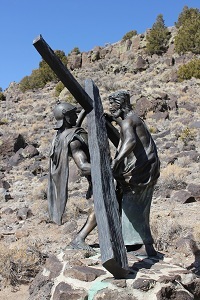 San Luis:Colorado’s oldest town and home to Stations of the Cross Shrine. Beginning in Alamosa you head north on Highway 17. Turning east onto Lane 6 North you begin your adventure towards the Great Sand Dunes. Just three more miles north on Highway 17 and you will find the Colorado Gator Farm. Over 300 alligators live here along with a large variety of snakes and other reptiles. 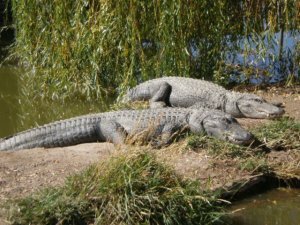 The alligators were originally brought to the San Luis Valley for fish waste removal on a fish farm but have become a public attraction. As you travel along Los Caminos Antiguos Scenic Byway keep an eye out for different points of interests. They are usually marked with a sign a mile or so before the actual spot to give you time to slow down. These pull over places have great information about the area and the views you are currently looking at. Continuing on east along Lane 6 North you will next see San Luis Lakes State Park. 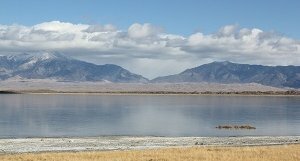 This is an excellent spot for fishing and boating as well as magnificent views of the Great Sand Dunes and Sangre de Cristo Mountain Range. After leaving San Luis Lakes you will continue east to a fork in the road. If you turn left you will reach the Great Sand Dunes and if you turn right you will continue on the Los Caminos Antiguos byway. I highly recommend visiting the Great Sand Dunes as they are the highest dunes in North America. Continuing south on the byway you will see the turnoff for Zapata Falls. The Zapata Fall picnic area has great views of the San Luis Valley and the Great Sand Dunes. It is a rough wash-board road to the picnic area but the views are worth it as well as the short hike to see the waterfall. 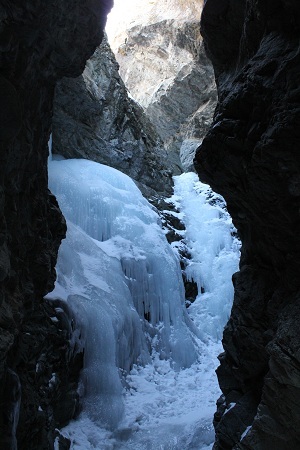 You can also hike to the falls during the winter to see a frozen waterfall. Continue your journey south to reconnect with Highway 160 and venture towards the towns of Blanca and Fort Garland. The Fort Garland Museum has a lot of historical information about the area. Fort Garland was established in 1858 to protect the first citizens of the San Luis Valley from the Native Americans. 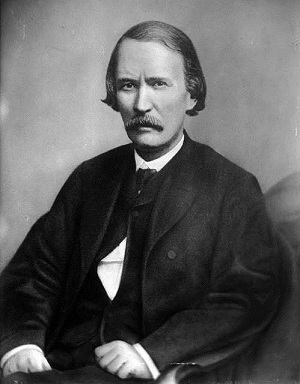 Kit Carson was in command here from 1866-1867. The Los Caminos Antiguos Scenic byway continues south along Highway 159 to the town of San Luis, Colorado’s oldest town. The town boasts the oldest water rights in Colorado and the oldest family store. Built on land that once belonged to Spain the area is rich in history. The Stations of the Cross Shrine is also in San Luis. There are 15 different stations with bronze statues depicting the last hours of Christ’s life. As you leave San Luis and begin driving west you will encounter miles of open space. You will pass through several very small towns, and I guarantee if you blink you will miss them. Most of this land has not changed in the past 100 years, and it is not hard to imagine Native Americans roaming the area. Look for the point of interest about half way between the towns of San Luis and Manassa. This is the first record of a Spaniard successfully crossing the Rio Grande River. During this time the Rio Grande River was estimated to be 250 feet across and at least 10 feet deep, making it very dangerous to cross. 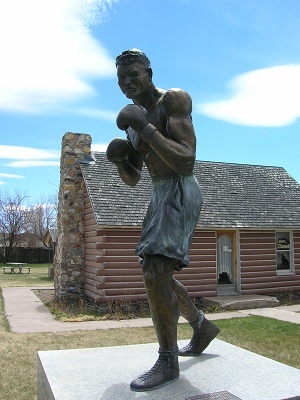 Upon entering Manassa you will see signs for their main attraction, the Jack Dempsey museum. Jack Dempsey was born in Manassa and was the heavyweight boxing champion in 1919-1926. Jack Dempsey is ranked as number 52 out of the Top 100 Athletes of the 20th century. Continuing along the Los Caminos Antiguos Scenic byway you will pass through the town of Romeo and turn south on to Highway 285. Continue to the towns of Antonito and Conejos, Colorado. 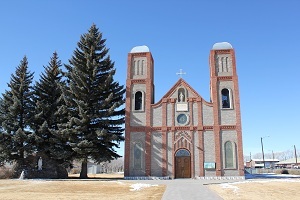 In Conejos you will find Our Lady of Guadalupe Church which is the oldest church in Colorado. The Cumbres y Toltec Railroad also leaves out of Antonito on its way to Chama, New Mexico. The track was built in 1880 as the “San Juan Extension” of the Denver & Rio Grande Railroads to the ore-rich Rocky Mountains. The track was abandoned in 1969 but some of it was saved to become a tourist attraction. Weaving its way through deep gorges and steep passes it was an engineering feat for the time and is still taking passengers on the ride of a lifetime! Take Highway 17 east to continue the scenic byway. This is a very scenic section of the byway so make sure you look for bighorn sheep, deer, elk, and a variety of birds. As the highway makes a switchback high above the Conejos canyon the overlook provides a beautiful view. The highway then drops off the mountain into Chama, New Mexico which is where the Los Caminos Antiguos Scenic Byway ends. A nice round trip drive if you are staying in Alamosa or nearby is to drive the Los Caminos Antiguos Scenic Byway starting in Alamosa all the way to Chama. Once you are in Chama follow Highway 84 to Pagosa Springs. Pagosa Springs has a lot to offer with little shops and a wonderful hot springs area to relax in after sitting in the car all day. From Pagosa Springs follow Highway 160 East over Wolf Creek Pass. Highway 160 will lead you through the towns of South Fork, Del Norte, and Monte Vista before returning you to your starting destination of Alamosa. This will extend your drive by a few hours but the scenery is wonderful and round trip drives are more fun as you never see the same thing twice!! Have You Been On This Scenic Byway? If you have driven this scenic byway please let us know about your trip. Did you see any wildlife or amazing views?